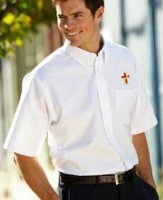 100% Egyptian Interlock Cotton - Short Sleeve Polo Deacon polo shirts, priest shirts and minister shirts with deacon cross, priest cross or minister cross : Deacon Apparel, Your source for quality clergy apparel, accessories, gifts, and vestments! 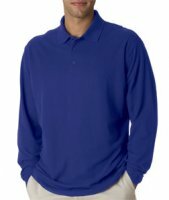 >THESE SHIRTS ARE BEING DISCONTINUED. QUANTITIES ARE LIMITED. 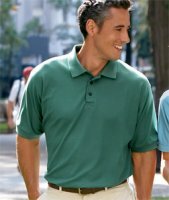 100% Egyptian Interlock Cotton Short Sleeve Polo for deacons, priests, and ministers. Egyptian Interlock: a creamy-smooth, durable piece of heaven. 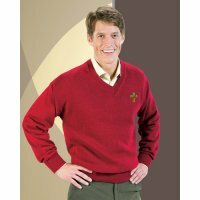 Coordinates with Ladies' 8506 and 8507. 100% combed ring-spun Egyptian cotton. 5.75 oz. Relaxed Fit. Split drop tail. Double-needle hem. Neck width from highest point of shoulder to highest point of shoulder. Chest 1" below armhole. Front length from highest point of shoulder top seam. Back length from center to bottom hem. Sleeve length from center of the back. Machine wash cold with like colors. Do not bleach. Tumble dry low. Warm iron if desired.